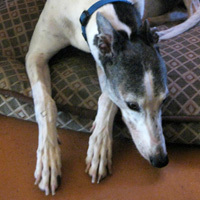 Devo is a 7-year-old boy who just came back to AGR through no fault of his own. He has been living in harmony with a fluffy cat and dominant female mix-breed dog for 4 years now. Devo is a handsome, big boy, weighing 89 pounds and measuring 28 in. tall at his back and 34 in. at his head. His previous owners suggest that his ideal home would have a dog door or someone home quite often.